« Stickers on fruit and vegetables – can you decipher their codes? Perhaps I don’t understand the business side of design and furniture manufacturing, but I’m always confused by the fact that certain historic chairs get re-licensed and reproduced, while others fade away. Often the ones that fade away are the ones I like most, while the ones reproduced ad infinitum are not my favourites. I find this odd. Recently I bought a vintage 1970s (?) chair from a secondhand shop (photos at bottom). I was told it was made by a Norwegian company called Westnofa. When I searched Westnofa online, I first discovered photos of the chair at top, which I prefer to mine. Mine’s nice, but this one is almost sculpture. Photos are from plastolux on Flickr. Thanks to Tyler for his permission to use these. See his whole Westnofa set. Further research on Westnofa suggests that it was not a manufacturer but rather an exporter of furniture made by other designers and companies. It is now hard to determine who actually designed each chair they exported. 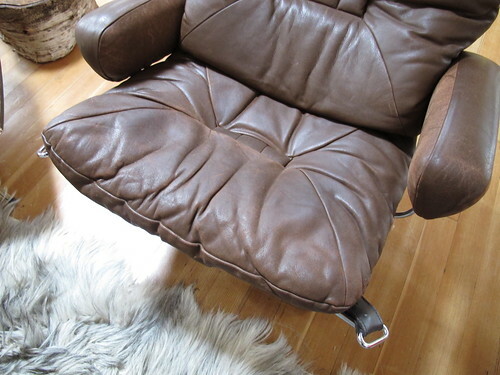 For instance, I was told that the chair I bought was either designed by Ingmar Relling or his brother, but I can’t verify that. He definitely designed one called the Siesta Chair, and this one gets lumped into it. Westnofa wasn’t an actual furniture company. Created in the 50s it was an export company for several manufacturers, including Stokke, etc to keep up with the international market, since Norway was kind of in a black hole in regards to the furniture market at that point in time. The companies that exist today that call themselves Westnofa, there is one in Canada that makes health and industrial furniture and the one left in Norway, that makes plastic products for Stokke still, have nothing really to do with the original Export company. It is almost impossible to figure out(at least so far for myself) to find out who the original designers of the miscellaneous Westnofa furniture are, and when I say miscellaneous I mean the pieces other than their famous “chair and matching ottoman” which are found easily. For example I have a dining room set with Westnofa tag that is black, art deco style with a floating glass top, bent wood chairs with hairpin legs. An amazing piece and obviously designed by a great, whether it be Opsvik, or another I don’t know. I’ve been trying and researching for months trying to learn about it, but to no avail…. In any case, I wish some of these chairs would be reissued. 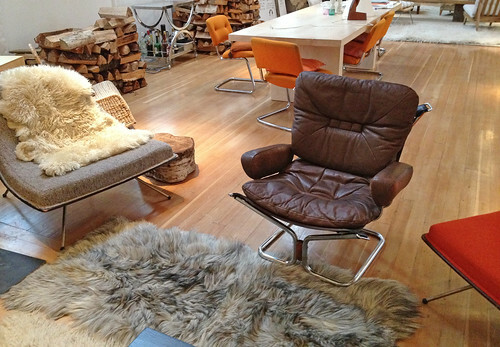 Pax to the Barcelona chair, but enough! Let’s give some credit to some other good designers. Also, let’s see some leather in colours other than brown and tan. Yellow? Orange? 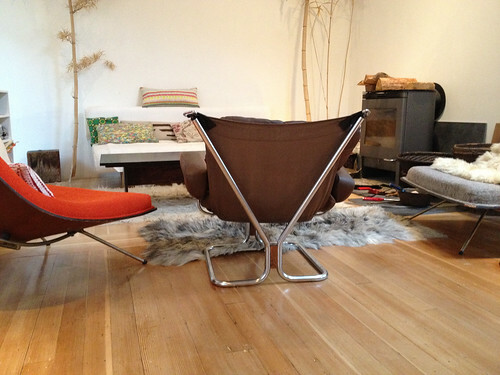 Below is the Westnofa chair I bought. It’s the single most comfortable chair I’ve ever sat in. By a long shot. And despite the fact that it has had a lot of wear, it’s still utterly sturdy, no sway or movement. 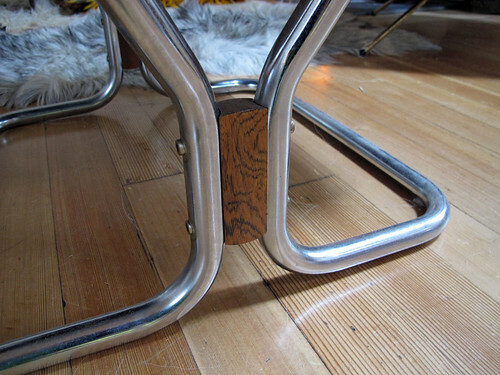 I like the chrome legs joined by blocks of unstained walnut. Also, the two cushions seem to be down-filled. If anyone knows more about Westnofa, or either of these chairs, please comment here! I’m particularly interested in the reason for the four oblong rings at top and front corners. 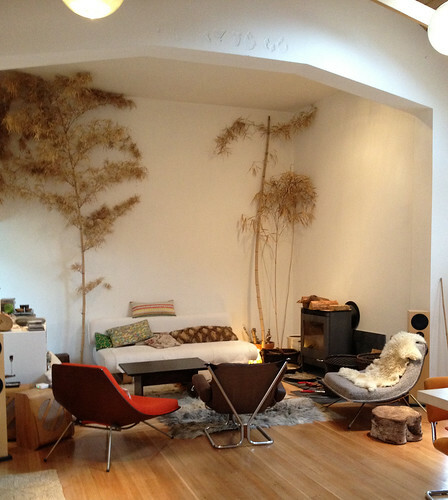 This entry was posted on Wednesday, May 30th, 2012 at 12:37 am	and is filed under design, furniture, interiors. You can follow any responses to this entry through the RSS 2.0 feed. You can leave a response, or trackback from your own site. Thank you! The man I bought it from said the same thing, but I found conflicting things online about Harald, so I wasn’t sure. Do you know anything else about him? I just bought one of these chairs with a matching ottoman. I’m trying to figure out if mines an original, it’s got lots of wear, still in fantastic shape. I can’t find much info on the chair, and absolutely none on the ottoman. I paid $50 for it. Damn comfortable.